Dark-Spotted Frogs are threatened in Russia's Amur River Basin and elsewhere by polluted waters and hunters. 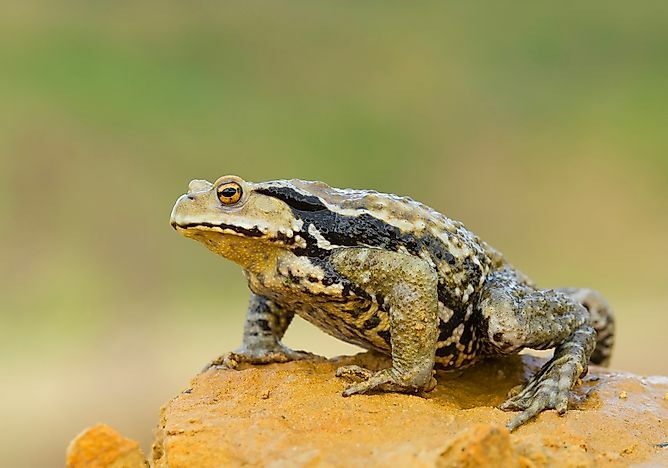 The Asiatic toad is one of many amphibians that can be found throughout Russia. Russia has a collection of abundant and undisturbed ecosystems, mainly in the northern areas of taiga (boreal forest) and the subarctic tundra of Siberia. It has about 27 species of amphibians, some of which are endemic to the country. Found in Russia's Amur Valley, this frog has vomerine teeth, free and forked tongue and webbed toes. Its eye pupil is horizontal. Although it prefers low altitudes, the dark-spotted frog can live in a wide range of habitats such as meadows, deserts and grasslands. Although it is relatively tolerant to human interference, it is increasingly threatened by hunting pressure and water pollution. The frog species is widespread and common in Russia and listed as least concern in the Red Data List. The Siberian wood frog's body is grayish or gray-brown with small dark spots. The belly is white with large irregular and partially focused blood-red spots. The frog is relatively restricted to lowlands and open grounds, although populations sometimes may occur in deciduous and coniferous forests. Hibernation occurs in September-November and March-May, depending on latitude. It hibernates in holes at the bottom of lakes, rivers, and wells in groups of up to a few thousand individuals. The Siberian wood frog has a lifespan of 5-11 years. The southern banded newt inhabits coniferous forest, mixed deciduous forests, temperate forest, rivers and freshwater wetlands. Reproduction occurs in lakes, ponds, drainage canals, and any other wet location. The frogspawn consists of 50-100 eggs. The newt has a broad range of distribution, although it is sensitive to habitat loss through forest destruction, overgrazing, pollution, and wetlands destruction. The Asiatic toad's body is dark-grey, gray-olive or olive-brownish with three wide longitudinal bands. The Asiatic toad prefers humid areas, and can be found throughout the Russian Far East. It feeds on insects and small amounts of invertebrates such as mollusks, myriapods, and arachnids. A variation of the common toad, its existence is widespread. Climate change affects most of the Russian biodiversity, especially the terrestrial flora and fauna. In this regard, Russia has approximately 35 national parks and a hundred strict nature reserves to cater for the endangered and rare biodiversity, many of which are listed by IUCN as endangered and threatened species. Most conservation efforts incline towards study, inventory, and protection of rare species of Russian amphibians, creating and managing new protection zones, as well as implementing improved environmental legislation. What Is A Cold Seep?